This map was submitted to Open Map Competition by Tesla7zap. Overall Score: 81% -> SPOTLIGHTED!!!! Map Layout: The idea behind the layout is simple, but good. The actual layout is more complex and the cliffs make for excellent opportuneties. Eye Candy: This map looks great. The ambient lighting is yellowish, making even the few undetailed areas look good. The lighting for tiberium is well done. There are many interesting things to see in this map, as the detailing is great. Playability: A great 6 player battle map. The player positions are quite fair and there are many ways of attacking your opponents. So, even though the bases are very close together, there are many backdoors to use. There are veins in the central gorge which is good. Triggers: Now this is a cool use of triggers. Every minute orso, a part of the map is revealed. First up is the central gorge, then the areas between the bases. It's a very cool and refreshing idea! research labs in top secret bases. The world economy was ruined. All wars ended due to the lack of funding. But, soon another meteor fell to the earth wich gave life to Tiberium on planet earth once again. The meteor, amazingly crashed at the same spot as the previous meteor, the Tiber River, Italy. Many people claimed they have seen lights on the sky the day of the meteors' arrival and that they have been abducted by aliens which were making tests on them and because of that, became a mutant. Many people also think that it is these aliens that is sending meteors with Tiberium to the earth, like if all humans were some kind of guinea pigs. Some UFO's also crashed here and there on earth but was soon to simply disappear in the blink of an eye. Soon the third Tiberium war began and was now all about getting a stronghold around the now dried out Tiber River, the origins of all Tiberium plant life. In the knowledge of that the Tiber River is the ideal place to hold because it was here that the Tiberium would grow most active. Smaller meteors continuesly rains down in periods. The first version of the Kodiak was also shot down here. Soon Nod managed to revive they're so called prophet, Kane. Many thought that Kane was God and that he had lived on earth ever since it's very first days. Kane was also saving the human kind from the tyrrany of the UN many said. They were off course brainwashed by propaganda which led to many voulanteers joining Nod. Also, reports of hostile Tiberium lifeforms in this area, as well as meteor and Ion storms, caution is advised. Commander, you know the drill, do your best on the battlefield. FS Tiber River 2356 should now be visible in the map folder in skirmish mode. 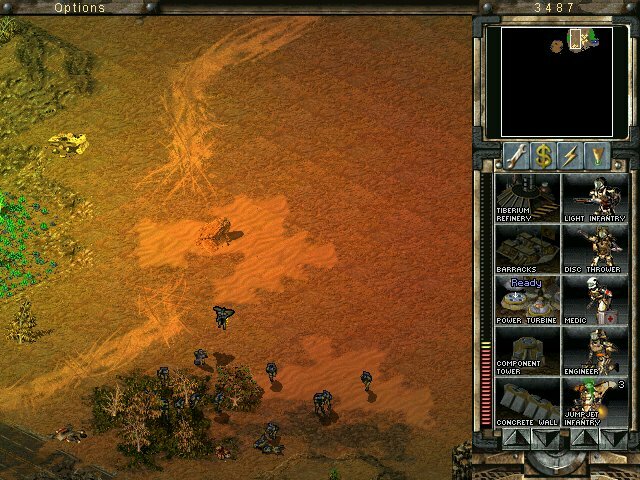 IMPORTANT: You need to have the expansion pack Command & Conquer: Tiberian Sun: Firestom to be able to play this map. - Hello TumSum! Here's my map for the contest. Details and such in the readme! Tiber River 2356 for download! there is, maybe because the both tiberium types often is too close to each other? What do you think of the winning map, SMIFF? I've played and I liked that a lot... the meteor storm usage is perfect and the detailing is very good. I also like the lightning of the map.